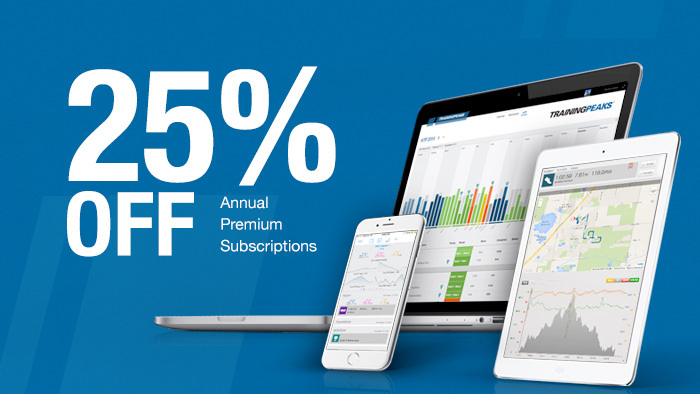 Save 25% on an Annual Premium Athlete Edition Account. With TrainingPeaks Premium, you’ll train smarter, not just harder. Plan your season and future workouts plus get daily email notifications to keep you on track. Target your perfect build and taper with the Performance Management Chart. Analyze fitness trends with 30+ power, HR, pace, distance and other charts. Assess your efforts using the map, graph and QuickView charts for each individual workout. Track fitness trends and analyze workouts while on the go with TrainingPeaks Mobile Apps for IOS & Android. Already have a Premium account? Renew now and we’ll add a discounted year on to the end of your current subscription.